This is my first post regarding a new tank build (I am new to planted aquariums, but have done reef). Been lurking here a while, but need some specific advice on plant choice for an aquascape that has a lot of variation in lighting levels. Quick tank summary: 24" rimless cube, Radion XR15FW G4 Pro LED, CO2 injection (in-line diffuser), Fluval G6 filter, ADA Aqua Soil, EI ferts via dosing pump. 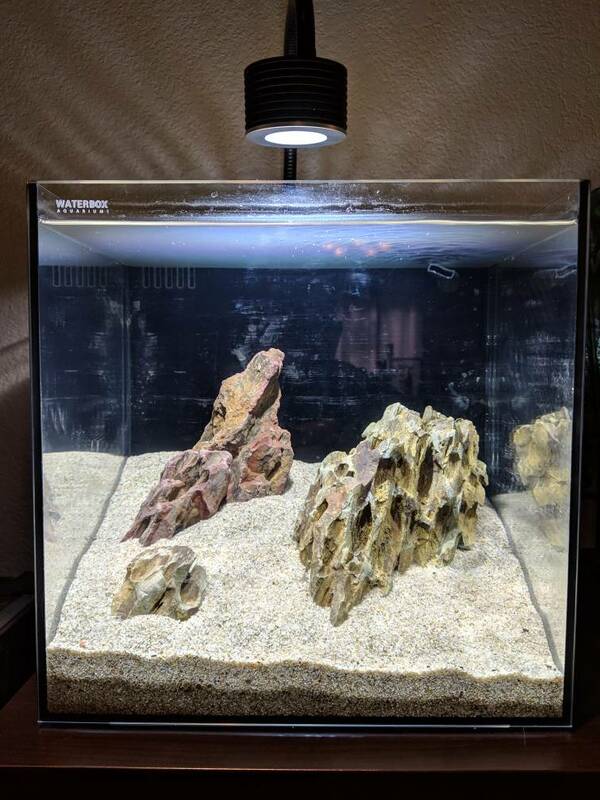 I am starting with an Iwagumi-style carpet-only (or at least predominant) tank and am going to give HC a try. First off, with "Pride Rock" dead center, I have a serious shadow to deal with. I tried to make that shadowed portion rock heavy, but would like to have something growing there. Was thinking maybe Java Moss, but its not my favorite. Kinda messy looking. Would love any suggestions on a low light, low growing plant that won't take off and obscure the cliff / elevation effect I'm going for. Second, I think it might look cool to get something growing up the slope on top of the central stone. Again, looking at mosses that could grow on the rock, but can also take the intensity of light right under the fixture (maybe Christmas?). I've searched here and Googled a lot, but have not found anything really definitive -- so thought I'd ask. Any advice welcome. mgeorges and AguaScape like this. Im digging this.. Cube tank, dope rock work and a cleanly wall mounted radion with no visible cord. Wow! What a great start! The tank, dragonstone hardscape, and light are gorgeous. The hard slope and dramatic angles really pop. I also love the way you created dams in the slope by strategic placement of rocks. You will get some light deflection into the shaded area once you have water and some surface agitation. Small anubias, buces, and some crypts would love that indirect light. I will be watching how this goes because I have a 60g Mr. Aqua cube and I still have not decided which direction to go with it. Much appreciated! I'll start looking into those plant options more thoroughly. And thanks for the kind words! I'm excited to really get going now that most of the infrastructure is in place. I'm going to do a tank build thread if you want to watch me make mistakes in front of a festival crowd. Beautiful start. It appears our minds work in similar ways. You just pulled it off a whole lot better! That's a good look -- I like the Waterbox and almost went that way, but got a good deal on the Aquamaxx. Do you like it so far? So far I like it. Really nice silicone work! I've been sidelined with other projects so haven't done anything with it other than this. I'm still second guessing my hardscape. This is supposed to be for my betta, not sure if I want to keep the jagged dragon stone with him. Maybe if I soften it up with some moss and fissidens.